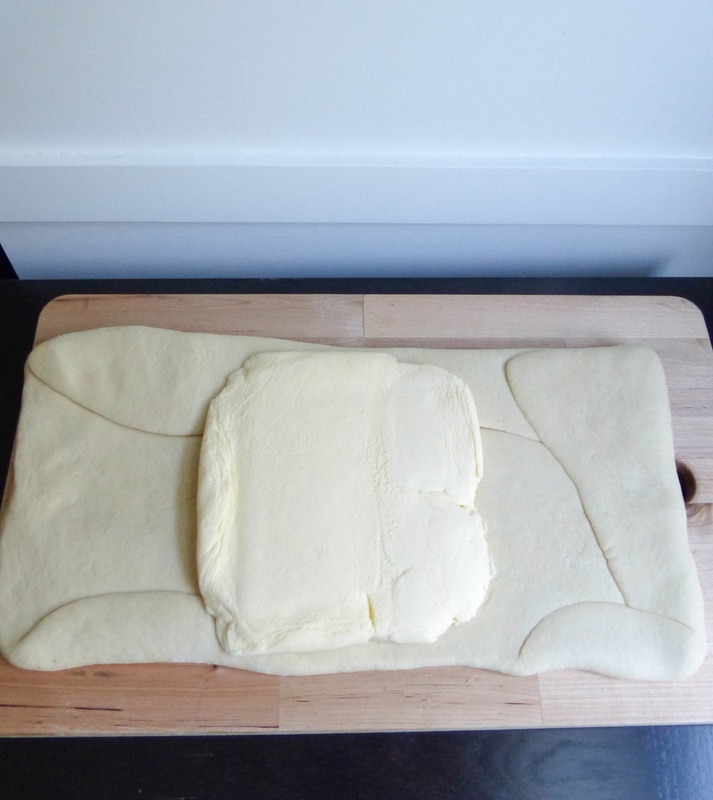 Moving on from puff pastry, we're making croissants for the next month. Croissants are a cousin to puff pastry, with the main difference being that croissant dough has yeast, where puff pastry relies solely on the steam from the butter to help it puff. 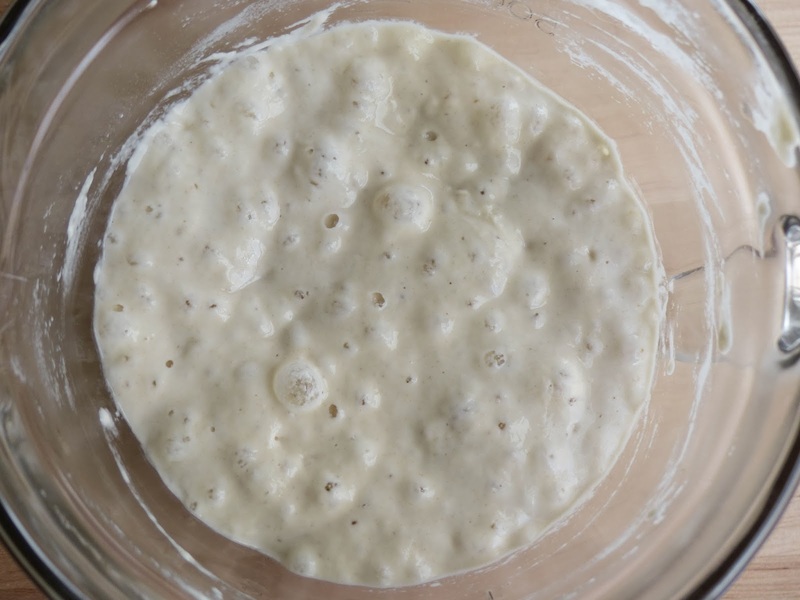 Croissant dough introduces us to poolish, a fermentation starter that we'll be using a lot of when we reach the bread chapter. It is a mixture of equal parts water and flour, with a pinch of yeast to get the fermentation started. After 12 hours, you can see and smell the results. 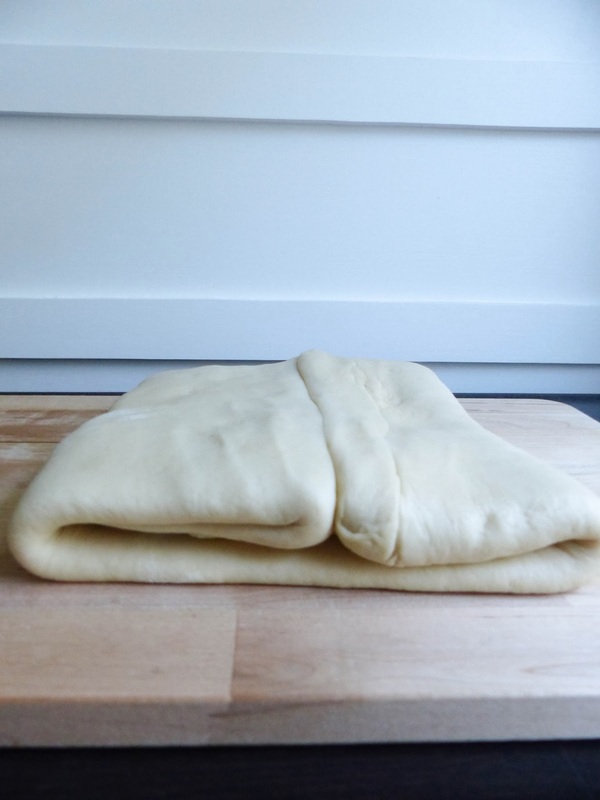 This dough is also folded and turned, but only 3 times. It's very important to keep the dough cold, to prevent the yeast from doing its job before you're ready. Over the next few weeks, we'll be making a few variations on the traditional croissant, but each one starts the same way, with this dough. Yay croissants! These are one of my favorite treats, and even a mediocre croissant is better than none! Although I have always been intimidated by the idea of making these from scratch, after making puff pastry I am more confident. But first, another hard to find ingredient: diastatic malt powder. I couldn't find it in any local stores, so I had to order it online. Apparently it breaks down starches so the yeast has more sugars to feed on, or so the internet tells me. I made the poolish, let it sit overnight. You can definitely tell when it's ready, it smells very yeast-y. When my shipment arrived, I made the dough. I used Plugra butter for the butter block. 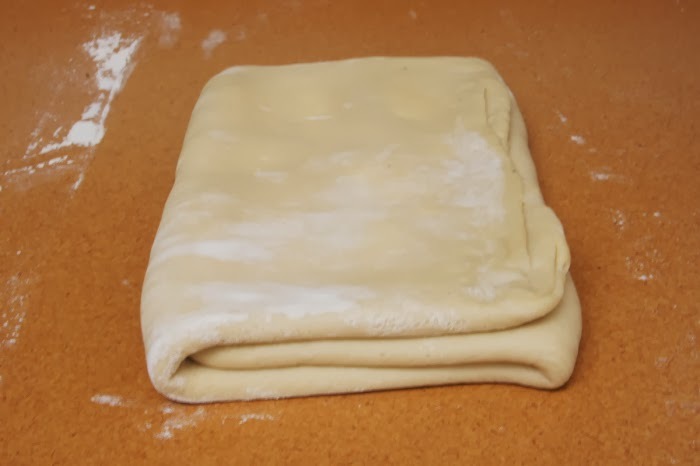 The technique of folding the butter block was similar to making puff pastry. I did have some difficulty making sure everything was perfectly straight and even, and the butter began to show through the dough in spots. 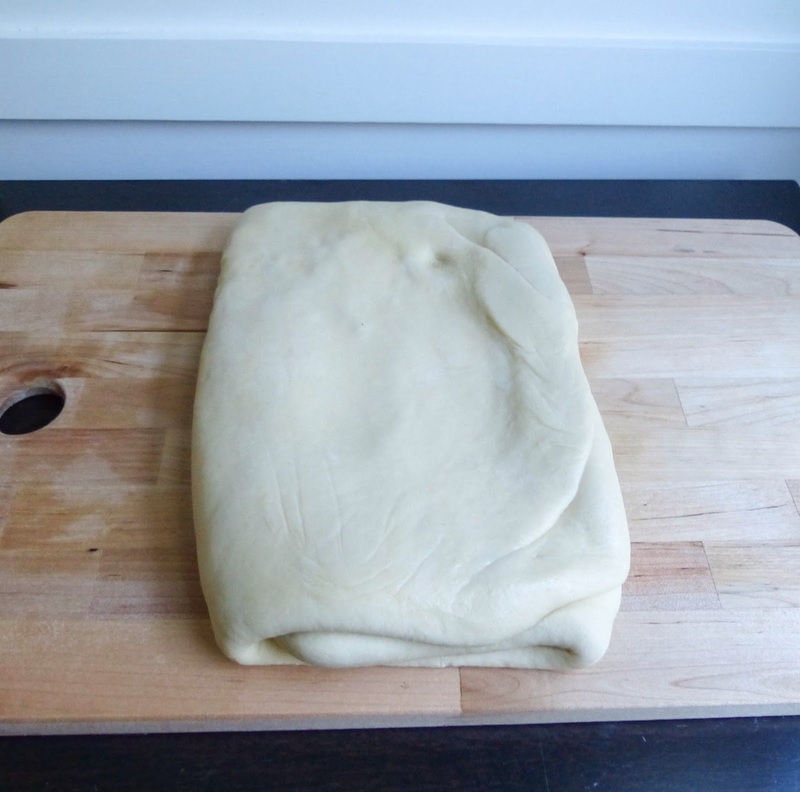 After three folds, the dough is ready to use. I can't wait to start baking fluffy croissants, although I'll have to give them all away so I'm not tempted to eat them for breakfast, lunch and dinner. Not that there's anything wrong with that. Thomas Keller’s Bouchon Bakery cookbook has an amazing, meticulous recipe for croissant dough, which can be used for classic French pastries: traditional croissants, pain au chocolat (chocolate croissants), and pain aux raisins. This is a weekend project, and I literally mean the whole weekend. I complained about the meticulousness of some recipes in this book in a previous post, but I actually really appreciated the level of precision in the recipe for the croissant dough. Read the rest on his blog!